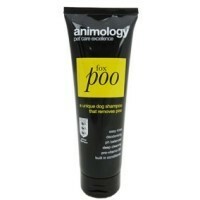 Animology Fox Poo Shampoo 250ml is a unique and effective method of removing stubborn fox poo and its disgusting odour from your dog's coat. As most dog owners know it isn't just fox poo that dogs like to roll in; if its sticky, slimy or stinky a dog will roll in it. Fox Poo Shampoo can also be used to remove poo from other animals including sheep, ducks, badgers and cows. Using Pro-Vitamin B5 and Conditioners, Animology Fox Poo Shampoo will clean and enrich your dog's coat, leaving a pleasant fragrance behind. My dog seems to find fox poo to roll in wherever we go and barely goes a day without rolling in poo of some kind! This shampoo is a godsend for us and works wonders!